See how a non-traditional workspace is changing the way a furniture dealership does business. 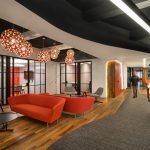 Lowe Campbell Ewald’s new office is designed to encourage creativity, collaboration, and a sense of history in Detroit. Get a sneak peek at our visit to AIREA STUDIO, one of this year’s top three Work Design NOW projects, and stay tuned for the full case study and video.